Mirabella V avails itself of two Captains who take turns during the year. We meet David Dawes first with whom we have a very interesting chat. Where were you born Captain? Which part of the world do you come from? I was born in Brisbane Australia, and I live in Rhode Island, USA. I have a daughter of 9 who is currently following a summer sailing school and of whom I am very proud. When did you first come into contact with the sea? Has someone in your family worked at sea? One of my first memories as a child is that of my father building me a 3 metre sailing boat, with which we had fun exploring the coast line. It was one way to look for adventure: I had a road map acting as a chart and some theatre binoculars instead of a proper telescope: real "Swallows and Amazons" stuff ( a children's book published in 1930, which tells of 6 boys going off on a sailing boat, doing some camping and thinking up a thousand different adventures set in nature.) Later, as an adolescent, it was fun camping around, sailing my Hobie Cat, windsurfing and meeting girls. Where did you do your studies? What schooling did you go for? My first study cycle took place in Australia, spending a number of months in Tasmania at the "Australian Maritime College". I later transferred to the United States where I obtained a Master's degree at the Maritime College and at the same time got licensed as a third officer with no limit to tonnage. Could you tell us something of your more significant experiences before becoming captain? Navigation on board merchant ships is boring but important because you are very seriously taught all about standard procedures. I have been able to appreciate the ability with which an enormous container ship is handled in harbour. But regattas were also a great experience, because I learned how to sail high performance technological boats. I was regularly employed on boats doing oceanic regattas, like the Sydney-Hobart and the Newport-Bermuda. Yet another way to seek adventure. Every boat I have been on has in fact taught me something, even a simple windsurf . My dream was to obtain a full Master Mariner Diploma, but a reduction in commercial sea-transport kept me from reaching my objective. I instead opted for a commercial licence in the States and for a less important one obtained in England. Could you tell us what Mirabella V is to you and where does her true soul lie? Mirabella V is a complete challenge for me. I don't know how many can take on a job like this without having a varied work experience to show on their Curriculum. My owner is someone who has amused himself in having a number of professionals interact in the design, construction and chartering of the boat. He seems equally happy in his helmet and jeans discussing technical matters in the Yard as he does when having breakfast on board with his four little nephews. To work for a man like that makes one involved. His wife also has a very open and smiling character. Both owners are the soul of this boat as well as the crew of course, who are the best I've ever had. What can you tell me about being a professional Captain? What is the secret to face the sea whilst at the same time organising everything on board so perfectly? The challenge in fact lies in organising things perfectly, but I don't think that is necessarily my strong point. I think I am a good leader and I know how to manoeuvre this boat well. However, I feel that the real secret lies in recruiting the right people and to know how to manage them well. Which is your favourite course? With Mirabella V, certainly the Caribbean and Greece are my favourite places as I am sure to find wind there. When the wind is very strong, we reduce sail in proportion, Mirabella V really goes like no other. We have found ourselves sailing in more than 30 knots of wind in Greece, in between rocks just with a jib up, and the going was so comfortable. Sometimes I must remind myself we're sailing in high winds because the boat is so perfect in those conditions that I don't even notice it. Which route are you missing? The Pacific and Australia too, but this time on a very big yacht. How would you briefly describe the life of a super yacht Captain, from both the professional and personal points of view? Is it hard to keep in touch with friends and family in this job? Professional yachting is hard for those who wish to maintain personal relationships. My advice to anybody wishing to take this life up, is to start young, and then to plan it in such a way as to come back on land before it's too late to have a family. But it must be said that many of us haven't found anything more edifying in life than sea-life. As far as I am concerned a bad day at sea is always better than a good day at the office! How do you get on with your owner? I began sailing for the Vittoria's about 15 years ago and I enjoy a very close relationship with them. They know my daughter and take an interest in her life. 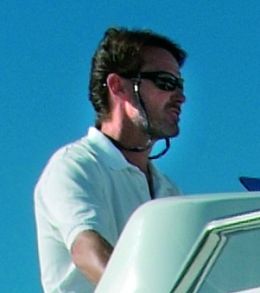 They are Italian, outgoing people and very active in running their three yachts. I am pleased when they are on board, because they have nice friends and a great family. Their time on board is however often very limited, so they have given me very important opportunities and responsibilities to go with them, for which I will always be grateful. THE CAPTAIN OF "MIRABELLA V"
Your fondest memory? My daughter's birth and watching her share my love for sailing as she grows up.